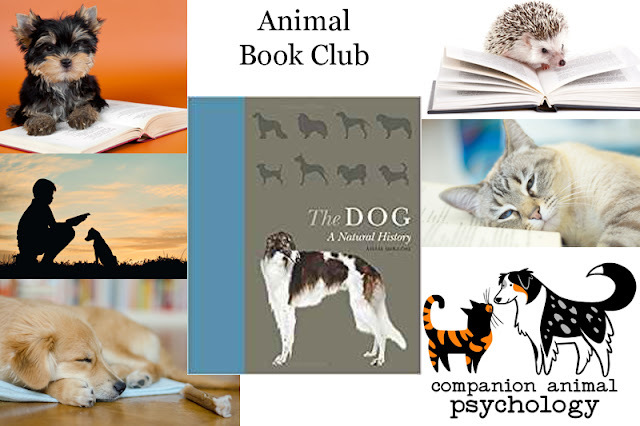 "An accessible and richly illustrated introduction to the natural history of dogs―from evolution, anatomy, cognition, and behavior to the relationship between dogs and humans"
The Companion Animal Psychology Book Club choice for October 2018 is The Dog: A Natural History by Ádám Miklósi. "As one of the oldest domesticated species, selectively bred over millennia to possess specific behaviors and physical characteristics, the dog enjoys a unique relationship with humans. More than any other animal, dogs are attuned to human behavior and emotions, and accordingly play a range of roles in society, from police and military work to sensory and emotional support. Selective breeding has led to the development of more than three hundred breeds that, despite vast differences, still belong to a single species, Canis familiaris. The Dog is an accessible, richly illustrated, and comprehensive introduction to the fascinating natural history and scientific understanding of this beloved species. Ádám Miklósi, a leading authority on dogs, provides an appealing overview of dogs' evolution and ecology; anatomy and biology; behavior and society; sensing, thinking, and personality; and connections to humans." Will you be reading too? Let me know your thoughts on the book! You can find a list of all the past and upcoming book club titles on my Animal Book Club Amazon store. And check back often as I will be adding lists of some of my favourite books and dog and cat toys over the next few weeks. Also new this month: The Animal Books Facebook group is for anyone who wants to chat about books about animals, share book reviews, news about new titles and interviews with authors, and tell us about your favourite animal books (old and new). All welcome. Do Dogs and Cats Get Along? Ask the Cat!